← Guess my shoes, win a prize! Brrrr! 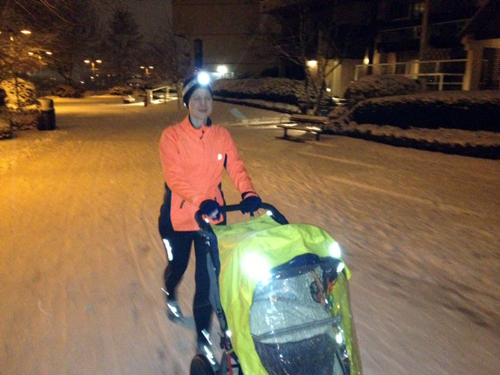 I’d forgotten what it was like to run in the snow! On Monday, Big Ring, Little Ring and I went for an evening run. 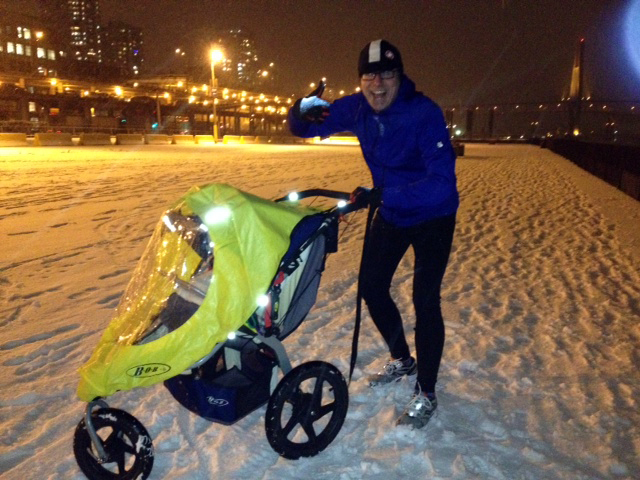 It was Big Ring’s first run of the season; Little Ring’s first run ever; and my first run with a stroller… mind you, Big Ring took the reins on that front, so in this post we’ll focus on the snow. I knew it had snowed, I’d gotten a morning text from Big Ring stating just that, I’d heard on the radio there was snow, and Facebook, my gawd, it was like scroll for the snow. But because I hadn’t stepped out of the loft all day, that snow didn’t fully register when dressing for the run. I dressed just as I’d been dressing for all my other runs: One base layer, plus an extra wicking shirt, long tights, arm warmers, running fleece, thermal socks, ear warmers and cheapo $1 mitts. And oh man, was I cold! My face was so frozen I couldn’t talk properly, my nose glowed like Rudolph’s, and my hands felt as though they’d crack off if I even so much as lightly bumped them against another object. Cold or not, though, that run was so much fun! (You did see my snow angel post right :)) The flakes exploding in my face, the uninterupted chats with Big Ring, and Little Ring snug as a sleeping bug in his BOB. It was just what I needed. In other news… the annual Hope-I-Don’t-Poison-My-Husband Birthday Feast was held on the weekend. 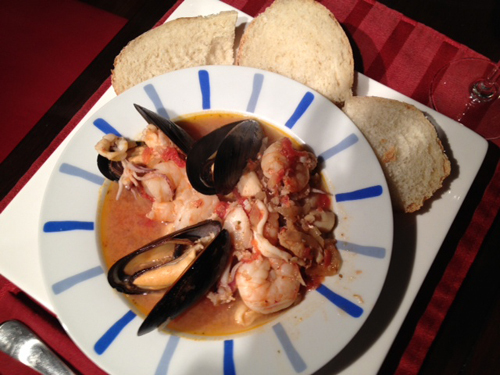 This year, instead of pasta, I tried my hand at cioppino, which I was first introduced to (thanks to one of my favourite running chicks) when in San Francisco for the Nike Women’s Run in 2011. And guess what? WE DIDN’T DIE!!! And guess what else? It was actually good! A whole lot of fishy goodness! And don’t forget to enter the draw for iBungee stretch laces. All guesses, whether right or wrong, get entered into the draw. This entry was posted in Diabetes, Running, Travel and tagged cioppino, Nike Women's Run, running, San Francisco, snow run, Type 1 diabetes. Bookmark the permalink. Looks great/delicious. I miss the snow.